Apple's notebook shipments totaled an estimated 3.98 million units in the second quarter of the 2017 calendar year, representing a quarter-on-quarter increase of 17.1 percent, according to new data published by market research firm TrendForce. Apple gained ground on ASUS at fifth place in the second quarter ranking, with a 0.7 percent increase over the previous quarter to leave both companies taking a 10 percent share of the market. TrendForce highlighted Apple's decision to upgrade its 12-inch MacBook as one of the reasons behind the gains. Apple trailed closely behind ASUS at fifth place in the second-quarter ranking. The updated 12-inch MacBook helped expand MacBook shipments by 17.1 percent from the first quarter to 3.98 million units. TrendForce also anticipates a double-digit sequential growth for third-quarter MacBook shipments as Apple will focus on the MacBook Pro series during the year’s second half. Global notebook shipments in the second quarter of 2017 registered a sequential quarterly increase of 5.7 percent and a year-on-year increase of 3.6 percent, totaling 39.96 million units. Sales in the U.S. and the arrival of new product models were said to be the main driving forces behind the second quarter shipments, with strong demand in the entire first half of 2017 exceeding market expectations. Tapping into back-to-school sales, HP's market share increased by 8.5 percent, allowing the company to retain first place in the global shipment ranking for the fifth consecutive quarter, while Dell posted the largest sequential increase of 21.3 percent to take third place in the ranking. 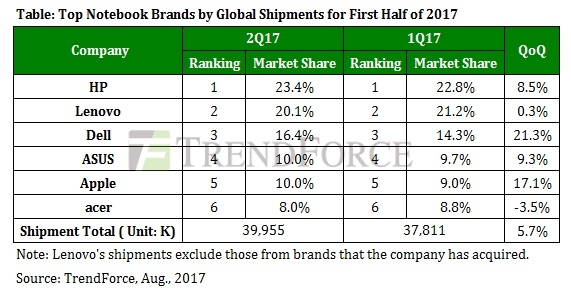 Lenovo meanwhile shipped just 8.05 million units in the second quarter, representing a year-on-year drop of 2.4 percent, with slowdown in the notebook market in the Asia-Pacific region said to have had an impact on the brand's performance. Acer's aggressive expansion in the Chromebook market did little to fend off rival models in the U.S., causing its notebook shipments to drop by 3.5 percent from the first quarter to 3.22 million units, with Acer remaining in sixth place in the global ranking. TrendForce noted there are worries in the market that the strong shipment result for this year's first half reflects demand pulling ahead, so shipments in the second half might be comparatively weak. Despite that, third-quarter notebook shipments are projected to increase by another 3-5 percent versus the previous quarter. 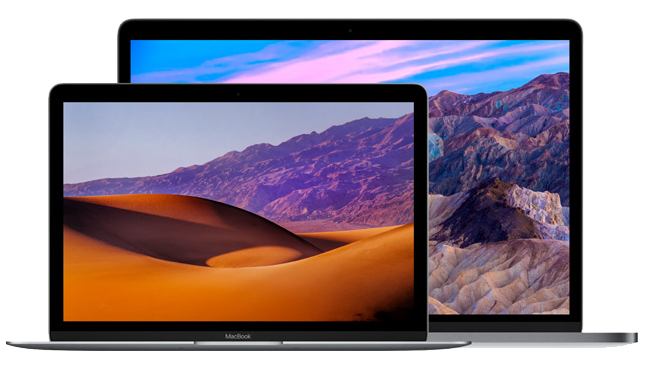 Apple updated its 13-inch and 15-inch Retina MacBook Pro notebooks in June, introducing faster processors and improved GPUs just eight months after the machines were last refreshed. It also introduced a new low-price 13-inch MacBook Pro sans Touch Bar with a 128GB SSD. No other changes were made to the MacBook Pro. According to KGI Securities analyst Ming-Chi Kuo, Apple is working on a high-end 15-inch MacBook Pro model that will include 32GB RAM, with production on this machine to begin early in the fourth quarter of 2017. Kuo claimed the MacBook Pro will be "the most significantly redesigned product this year" with desktop-class RAM to appeal to high-end users. i thought no one was buying high priced new macbooks ? Fortunately, Apple's consumer base extends far beyond an increasingly vocal (and whiny) minority on Macrumours. Still doesn't make me want to buy one of Apples new insanely-overpriced models. When my 2015 (I think) MBP finally stops working I guess I'll have a decision to make. Hopefully that decision doesn't involve a silly emoji bar. Maybe you should look into what you can do with the touch bar before calling it "a silly emoji bar". But MacRumors readers were 100% certain it was a total failure of a product and no one would buy it. Just last week, Consumer Reports revealed their 2017 Reliability ratings - and Microsoft was dead last, with Surface failure rates of 25%. Pretty bad. Tops (in reliability order) were: Apple, Samsung, Acer, HP, Asus, Lenovo, Dell, Toshiba, and then Microsoft. Surface sales sinking and Mac laptops soaring. Huge FAIL of The Verge reviewers and MR forum vocal minorities. As someone who owns a 2016 15" rMBP with the TouchBar, the answer to that is still "not much". After the better part of a year, most developers still do have no good ideas how to put that thing to proper use. Even for emojis, you probably are better off to use the old symbol palette. As if Apple is the only manufacturer updating their line. Where is the champion Microsoft on the table? Is this the Microsoft’s heat from the Surface? Are people asking for touchscreens or not? Is a $6 dollar USB-C to USB-A adapter (set of 2 obvs.) from Amazon a problem for people buying $2000 computers? Don’t tell me Microsoft is having problems making people part with the cash, because Apple, the expensive one, clearly isn’t! Because, unfortunately, the human population's ratio of smart people vs the rest is not that great.